I eat a lot more salads in the summer, even when the weather is bleugh. Sometimes we have a salad like this smashed potato salad or a pasta salad for dinner (like we did last night), for lunch it might be a couscous salad and at other meals you will often find salad on the side. In fact I think we eat more salad vegetables than any other type at this time of year. Salads are so quick and easy and a lot less cooking too. This smashed potato salad came about after I got a new grill. My George Foreman grill died and instead of splashing out on another one, I got a much cheaper and smaller grill and it was pretty useless. When I was making toasties I had to stand a can on top of it for some extra weight so the toasties would brown and they were still disappointing. Luckily my next grill was much more substantial and had more weight to it. Do you ever do that? Go for a cheaper option when one of your kitchen gadgets dies and instantly regret it? I should have known better than to buy cheap. You would think I had learned that lesson over the years. I'd hate to add up the money I have wasted buying a bargain. Seriously, when you buy kitchen gadgets you need to spend a bit of money if you want something that will do the job well. I have wasted money on cheap blenders, bread makers, grills and even handheld hoovers and I now know the truth that buying cheap is not a saving but a waste of money. I recently made the same mistake with the aforementioned hand held hoover. Well I totally got distracted from my recipe with my little rant there, didn't I? This didn't start out as a sales post, but some things really irritate me! So back to the salad. After grilling vegetables in my new grill, I had the idea for smashed potatoes. I lightly boiled potatoes, then popped them into my grill and pressed down with the lid, effectively smooshing them. The outside was crisp with those pleasing grilled stripes, but I used no oil so lower fat and calorie than roast potatoes. Now lets face it, you can't beat roast potatoes, but these make a quicker and healthier substitute and turned my salad into a more substantial meal. I also grilled some sliced carrot and courgette, teamed it with fresh salad and dressed it with some pesto that was thinned down with a little olive oil. 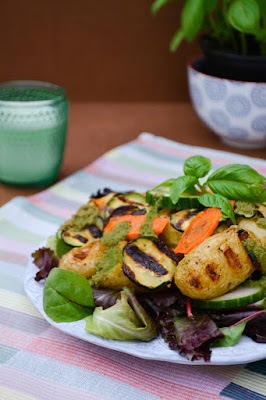 A grilled potato salad with grilled vegetables and fresh salad, dressed with dairy-free pesto dressing. 1. Heat your grill. 2. Grill the carrot and courgette slices until soft and set aside. 3. Next grill the potatoes, pressing down on the grill to smoosh the potatoes.4. 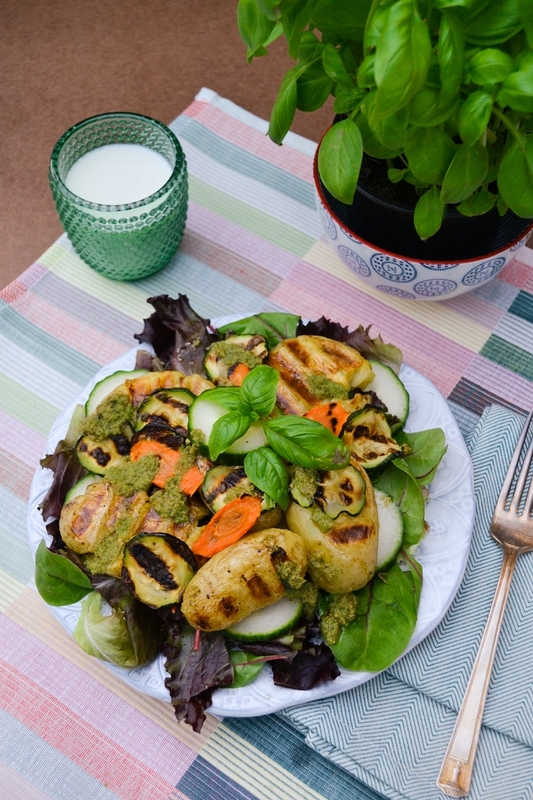 While the potatoes are grilling, fill two plates with salad leaves, then top with cucumber and the grilled vegetables.5. Mix the pesto with the olive oil and season with pepper.6. Add the grilled potatoes to the salad and drizzle with the dressing.7.Enjoy! I have never tried any Salad with Potato. But will try it soon as it looks yummy and healthy. Oh you must, it makes for a really filling salad. What a great recipe! I have also bought some cheap things that were disappointing but I also have bad experience with expensive stuff that was not worth the money so sometimes it's hard to choose the right thing. No you are right, but sometimes it's worth paying for the best. I have found cheap supermarket kettles are quite good. I love that this almost like a deconstructed potato salad!It is genious!!! I think we are so glad winter is over we go crazy and of course they make for easy meals. You'll get what you paid for in buying cheap stuff particularly in gadgets. I've learned my lesson as well, so I'm more conscious now. Btw, this salad is a winner. Thanks for sharing. Yes me too, way too much money wasted on cheap to middling price gadgets. This looks delicious. I love pesto! It really perks a salad up. I prefer homemade pesto, but I always have jars in the cupboard just in case. This looks like my kind of recipe! I love how you added pesto to this. I first made pesto the other day and I'm happpy to see another way that I can use it! Oh good, homemade pesto tastes fabulous and would be great in this dish. Yes just perfect for a light meal and yes about the potatoes. 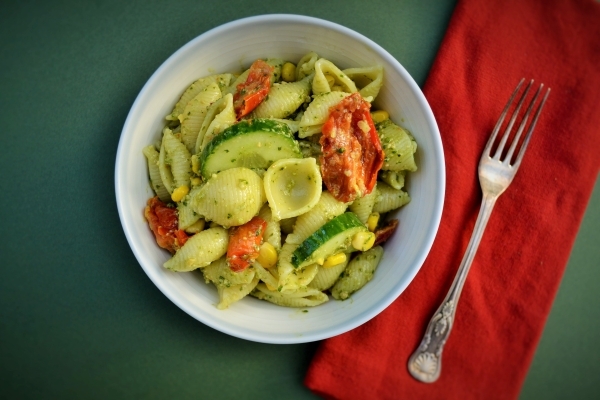 Yes to dairy free pesto! And also yes to investing in better quality appliances. I can't live without my Optimum G2.1 and my Dyson!